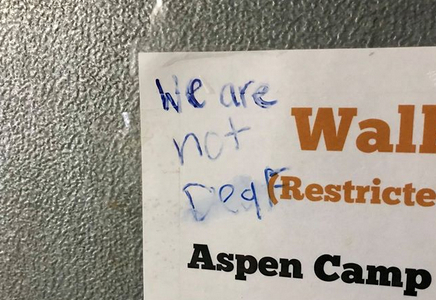 Someone has vandalized the Aspen Camp of the Deaf and Hard of Hearing in Colorado. The camp rented out its cabins to Airbnb guests this past weekend while Aspen hosted the X-Games, according to KUSA-TV. But one of the groups caused about $4,000 of damages to the camp's common area. Read more at KUSA here. You'll find the camp's Facebook page here with more information and an ASL video. Jeff Beck is suing Sumner County Schools in Tennessee over the education of his deaf son. WTOL-TV has a video report. No captions but you can read the story here. The Florida House unanimously approved a bill today that would require the state officials to hire a qualified sign language interpreter at televised hurricane briefings. The bill was motivated by having a man incompetantly attempt to interpret evacuation orders just before Hurricane Irma. The bill is sponsored by Richard Stark and you can read the text of the bill here. Following a false alarm in Hawaii that a ballistic missile was on its way, state and federal officials are reconsidering how emergency cellphone alerts are set up. CNET has gathered some of the basic information about the system here. Cleveland's City Council is refusing to pay for sign-language interpreters at its meetings. Rico Dancy asked for an interpreter back in October, according to Cleveland.com. The City Council provided interpreters for three meetings but now has told him he isn't deaf enough to justify an interprter. Read the full story here. Prosecutors are identifying the man who led Jersey City police on a chase in a stolen SUV on Tuesday. They say Oriental Hamlet of Jersey City is facing charges of aggravated manslaughter and leaving the scene of an accident. Hamlet hit and killed Umar King who worked for FedEx worker and was a comedian on the side. Two other suspects feld on foot. Below is video with survellence footage of the SUV when Hamlet crashed. No captions but you can read the story at the Daily Mail here. Deaf professionals from the space industry visited students at Austin's Texas School for the Deaf this week. KHOU-TV has a video reporter. German researchers claim children with cochlear implants learn words faster than those with normal hearing. Niki Vavatzanidis tells News Medical that children typically need about 14 months to spot mislabeled objects, but children with an implant were able to do so after only 12 months. Another researcher said, "Children with cochlear implants could help us understand the general processes of language acquisition and determine which single steps are age-dependent." Read the full story here. The driver of a stolen SUV hit and killed a deaf man in Jersey city, New Jersey Tuesday. A friend of the victim told WABC-TV, "He was a gentle person. He would give his jacket off his back. Support you in anything. Kind-hearted person, loving person." There's more on the story in this video or read details here. 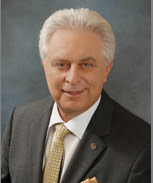 It was on this day (Jan. 23) in 2013 that Gallaudet lost one of its professors. Laura Snyder-Gardner and her teenage daughter, Marry Ann, died in a fire in the northern Virginia town of Falls Church. They had moved from Florida to the DC suburb just a couple of years before. Neighbors say the neighborhood was rocked by a loud noise before the fire broke out. Gardner was 48 years old and had worked at Gallaudet since 2009. She served as an assistant coach of the girls' soccer team at the Model Secondary School for the Deaf last year. Delta has seen an 84 percent increase in reported animal incidents since 2016, including urination/defecation, biting and even a widely reported attack by a 70-pound dog. In 2017, Delta employees reported increased acts of aggression (barking, growling, lunging and biting) from service and support animals, behavior not typically seen in these animals when properly trained and working. Read the full details of the change from Delta here. Profoundly deaf six year old Maisie Sly is the star of The Silent Child, a short film which could be vying for an Oscar. Find out more about it in this BBC video. Two deaf students are have filed a lawsuit against a Louisiana community college for not providing them with interpreters. Lee Em Bruce and Ronneka Smith says they tried to work with officials on campus but were not accomodated, so they've filed a suit against the Delgado Community College. Read the full story here. A deaf school wants to change a rule requiring it's leader to know sign language and have experience working with deaf children. The South Dakota Board of Regents is asking the state legisalture to make the change over the objections of parents and educators so that it will be easier to combine the leadership of the state deaf school and the state blind school. Read the full story in the Argus Leader here. A deaf student at National Technical Institute for the Deaf in Rochester was hit by a truck last night. WHAM-TV says the student had "serious injuries" and offers this video report. Some deaf children with cochlear implants still lag behind their hearing peers in educational development. Researchers are now using brain MRIs to "construct a machine-learning algorithm to predict language development," reports WTTW-TV. They hope the results will make it easier to spot the children with implants who are falling behind. Read the full story here. 2015 - The FCC sets “quality” standards for captioning by TV broadcasters focusing on: Accuracy, synchronicity (timing with the words being captioned), completeness (from the start of a program to the end), and placement (the captions shouldn't obscure other important information). More info here. 2016 - A new set of rules related to captioning by TV broadcasters kicks in: The FCC divides responsibility for closed captioning compliance between distributors and programmers. The Commission also identifies the proper methods for measuring closed captioning compliance and responding to consumer complaints. Waivers - The FCC has made exceptions to the rules when the broadcaster shows captioning would cause an “undue economic burden” standard. Consumer groups have opposed the waiver requests. Some requests from churches and other organizations have been denied, mostly because a review of the group's financies shows they indeed have the funds to provide captioning and simply don't want to do so. The FCC also says captioning is not a religious freedom issue, as some have claimed. —The FCC says TV stations captioning their news by using the telepropter text (or from news scripts) is not adequate by itself. If this method of captioning is used, known as Electronic Newsroom Technique, the station must have a designated “ENT coordinator" whose responisibility it is to make sure this service is properly conducted. There's more information here. —Live interviews and breaking news segments should include "crawls" at the bottom of the screen or other information through text. 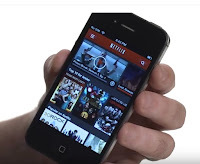 —Closed captioning must be provided for video over the internet if the programming was shown on TV in the US with captions. If the programming was aired on TV before 2013, it may be exempt until it is shown on TV again. —If an old program is shown on TV, the distributor and TV station are required to provide captions within 15 days. —Video clips, outtakes and montages of captioned TV programming posted online must be captioned. —Live programming must be captioned within 12 hours if posted online. Nearly live material must be captioned within eight hours of the conclusion of the program. For more information, a Washington broadcast-focused law firm has links to helpful posts here. Every day scammers come up with new ways to steal taxpayers’ identities and personal information. Some scammers pretend to be from the IRS with one goal in mind: to steal money. Be aware that con artists will use video relay services (VRS) to try to scam deaf and hard of hearing individuals. Don’t become a victim. Deaf and hard of hearing taxpayers should avoid giving out personal and financial information to anyone they do not know. Always confirm that the person requesting personal information is who they say they are. Kevin Hall has spent 14 years on the PGA Tour. At one time, he won the Big Ten Championship while golfing for Ohio State. Now he toils in the sport's minors. He tells Yahoo Sports, "Golf is what I do, but in the grand scheme of things, God is using me to serve as an inspiration to others." Read the full story here. More that 60 video tapes decumenting the ASL poetry and literature movement in Rochester will be lost unless they are digitized—and now the National Technical Institute for the Deaf in Rochester has the funds to transfer the video. "The digitized videos will be one of the largest collections of online publicly accessible rare ASL literature in the country," according to the NTID. Read more about the project here. Gallaudet University in Washington, DC has won Helmet Tracker's Helmet Bowl competition. The company searches for new uses of technology to help equipment managers do their jobs more effectively. Read more about how Gallaudet won here. Below is a video report from Fox5dc recorded before the final results were announced. "The (American) Civil War dramatically changed the course of deaf people’s lives. In many ways, the national crisis empowered many to believe in their own abilities," writes Harry G. Lang, a professor at Rochester Institute of Technology’s National Technical Institute for the Deaf. Lang explains out it brought "the nation's deaf population out of society's shadows. Read about it in Rochester's Democrat and Chronicle. The owner of Denver’s Pepsi Center has made an agreement to settle a lawsuit over captioning. If a judge approves, the Kroenke Arena Company would be required to provide captioning on the video boards inside the arena for nearly all the sporting events. Kirstin Kurlander, who is deaf, filed the original suit and is quoted as saying, “I am happy that Kroenke and the Pepsi Center have agreed to provide captioning at the Pepsi Center so deaf and hard of hearing patrons will finally have equal access to the games at that arena.” Read more from the Denver Post here. 12-year-old Carly Ortega will sign the national anthem at the college football championship game Monday night. The Zac Brown Band play the Star-Spangled Banner before the Georgia Bulldogs and the Alabama's Crimson Tide face off. Carly told WSB-TV that she is doing it in honor of her mother who recently died of cancer but admits, "I’m going to be nervous and pretty scared." 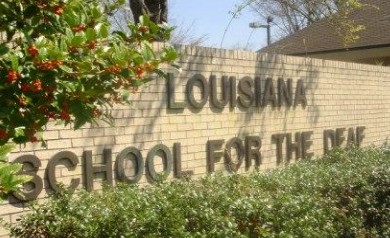 This Deaf School "needs an overhaul"
The Louisiana School for the Deaf needs an overhaul, says a member of the state's top school board. The Associated Press quotes, Kathy Edmonston, a member of the Board of Elementary and Secondary Education, as saying, "A couple of issues brought up by the folks that I have been working with from the deaf community feel like the kids are not getting a quality education at the school." Read the full story here.